A thorough 30 point visual inspection of the unit and the surrounding area will be conducted to ensure the cleanliness of the unit, code compliance, and to detect for any potential problem areas. For air cooled units only. All cooling paths for engine/generator and enclosure will be checked for obstructions. The level and condition of the lubricating oil will be checked. If required, oil will be added to bring the level to the full mark. 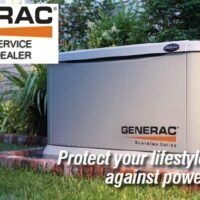 Once annually, the oil and filter will be replaced using Generac approved parts. All exhaust fittings will be checked to ensure tightness and to present exhaust leaks. A visual check of the gas plumbing will be performed from the gas supply to the generator set to ensure use of all proper fittings and to prevent problems due to corrosion, vibration or high temperatures. A leak detection test will be performed from the gas supply to the generator set using an electronic leak detector. This check will be made to ensure all gas fittings are sealed. An inspection to the battery and charging circuit will be made to ensure correct charging voltage, standby voltage, and electrolyte level (unsealed batteries only). The battery connections will be checked for tightness. Any corrosion will be removed for good electrical start. Spark plugs will be inspected to ensure correct gap, cleanliness, and to diagnose combustion issues before they become problematic. Air filter will be inspected to ensure cleanliness and changed as per Generac’s maintenance recommendations. The cold starting behaviour will be checked at the late fall/early winter inspection. A load transfer will be conducted to ensure proper operation of the transfer switch and the system as a whole.